I’m so glad I decided to attend the California Charter Schools Association Conference in Long Beach this week. It’s really hard for me to be away from school, but I know our school will benefit from what I learned over the past few days. I often leave conferences energized and eager to implement all I learned. I want to take the time to reflect on the sessions I attended, and think about what are the 1-2 things I want to take away from each session so that I don’t make empty promises and feel completely overwhelmed by everything I learned. Warning, this is long, VERY focused on education, and has just a bit of running thrown in the middle. Tuesday started with our opening plenary. My amazing boss Malka Borrego was honored with the Hart Vision Leader of the Year Award. I feel so lucky to work with such a smart, passionate, and hard working leader. This is who I get to work with every day! It was the perfect way to start three days of learning. We then jumped into three sessions. Alaina and I attended a meet and greet for new schools where we got to talk to the CCSA President Jed Wallace about the challenges of opening a new charter school. I then attended The Elephant in the Room: Why Race Matters in Education Reform led by Angela Bass. She’s led PD at Equitas before, and it was a great opportunity for us to discuss issues of race in education. We watched a short film “Teached” on the path to prison and an awesome TED talk by Mellody Hobson called “Color Blind or Color Brave.” This kinda got the energy going. We then worked in groups to share our reflections and our personal narratives. Oddly enough that same day my sisters and I were emailing back and forth about our feelings with our ethnic identity. I talked about my struggle to confidently associate as half Mexican. In the US being Mexican is often associated with having dark features, being from a low socio-economic background, and being from the inner-city. Latinos can be guilty of labelling too and might not accept you if you fit that mold. If you talk white or grew up going to private school you’re not a “real Latino.” I personally think the Latino community should embrace their diversity of experiences rather than further divide themselves. Anyways, enough rambling. My #1 take away from this session is that during August PD we need all teachers to share their personal narratives, so that we can gain a better understanding of our experiences that led us into the work we do. Next I went to a session called Sustainable Education: One Teacher at a Time. It was SO helpful to know that many of the seemingly dumb EQ3 practices really are building a culture of sustainability. I will continue to engage teachers in our hiring, keep traditions like the Gracias Madre Happy Hour before PD begins, Founders Day Mendocino Farms lunch after the first day of school, Sprinkles after streaks of incredible attendance, and paper plate awards at the end of the year. I commit to scheduling these out in June for the following year, and adding a few fun new ideas like the surprise “I love you a latte” and pinterest teacher survival kits. Alaina, I took photos of the sheets form the session and have them below 🙂 I know you wanted copies! We also talked about different teachers styles (those who need autonomy, mastery, purpose, or belonging) and how to support them. It was helpful to think about my staff and whether they seek to belong to a team, whether they really value autonomy, or if they need constant reminding of the purpose of a specific task or project. And the last session I attended was with Alaina. It was called Special Education: Innovations, Initiatives and Insights From the Experts. It was fascinating! A team from CCSA visited schools across the state who were performing as outliers with their special education population, and found the following major themes. We have most of these structures in place at EQ3, we just need to maintain them as we grow. 1 thing I’d like to work on is creating a strong restorative justice practice. Our behavioral system is not quite streamlined yet, and we’ll need a clear system as we grow. OK let’s take a break from education and talk running. 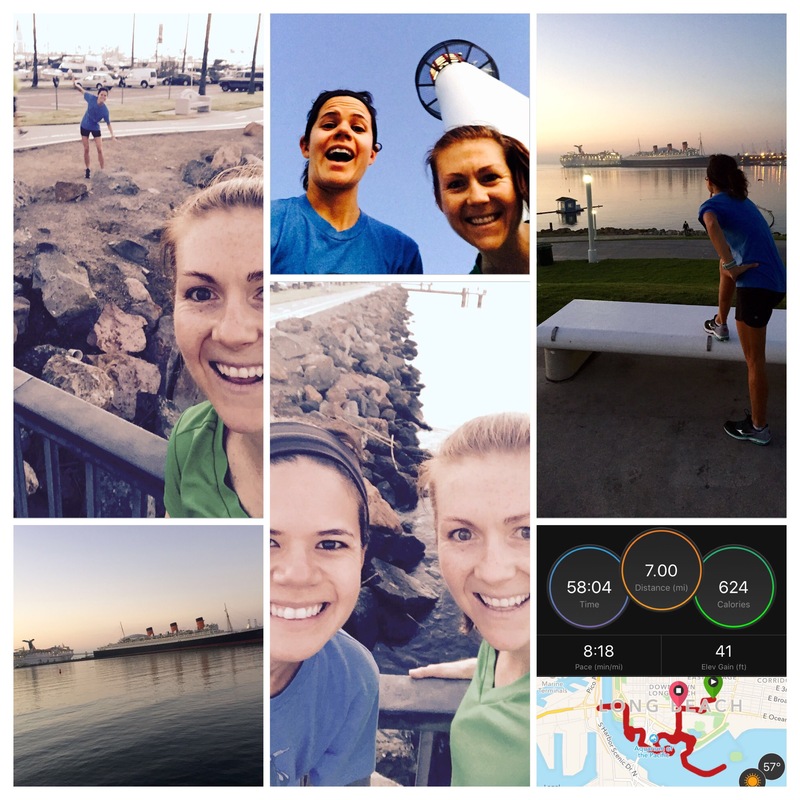 Gisele lives in Long Beach, which was amazing because we were able to run together three mornings in a row! Tuesday was an easy run at about an 8:30 pace, Wednesday was 4 x 0.75 at a 6:30 pace (I averaged more like 6:10/6:15) and Thursday was another easy day and 8:20. We had so much fun exploring the Queen Mary, the pier, the Grand Prix course, BEAUTIFUL Naples, Belmont Shores. Running before everyone is awake really is the best way to explore a city. Long Beach, I’m sorry for ever doubting you. You have a lot to offer! Can’t take credit for this photo, but isn’t it beautiful!? Loved running in Naples. My favorite building in Long Beach. OK back to the conference. Wednesday I went to this AMAZING session on Developing a Growth Mindset in Students and Teachers. 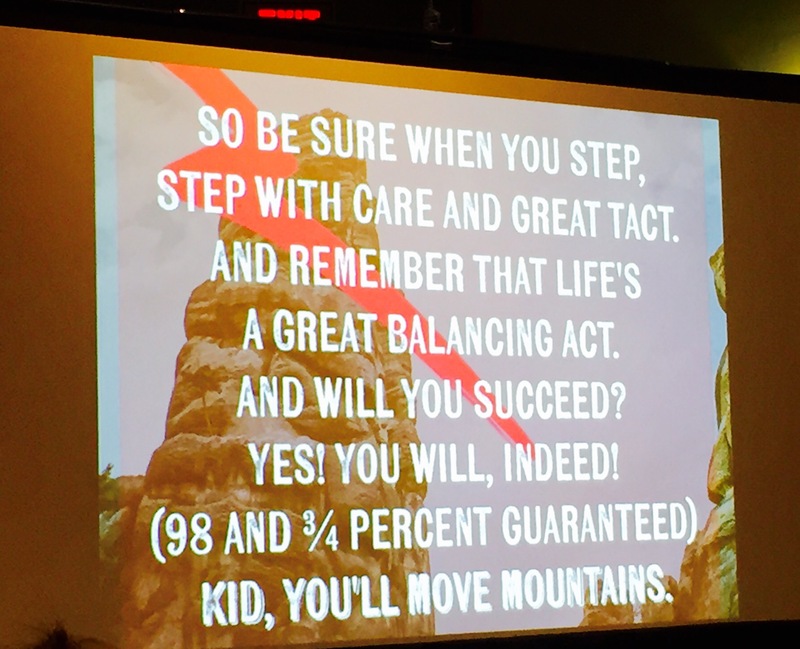 I have 2 great takeaways from this session. 1, an awesome team builder to help build a culture of growth. You start with a partner and count back and forth to three. When someone makes a mistake you clap and encourage them. Next round, you clap, say two, then three. Again, you clap when your partner makes a mistake and cheer, rather than making them feel like an idiot. Final round has a clap, snap, then you say 3. You then go back to the regular 1-2-3 and celebrate the growth you made and how much you’re improving. I probably did not explain that well AT ALL, but Alaina is leading it at our PD Day after spring break so Equitas staff will see it in action. We also completed this great activity that I think could be used for morning meeting. Teams were given a bag of items and a challenge. 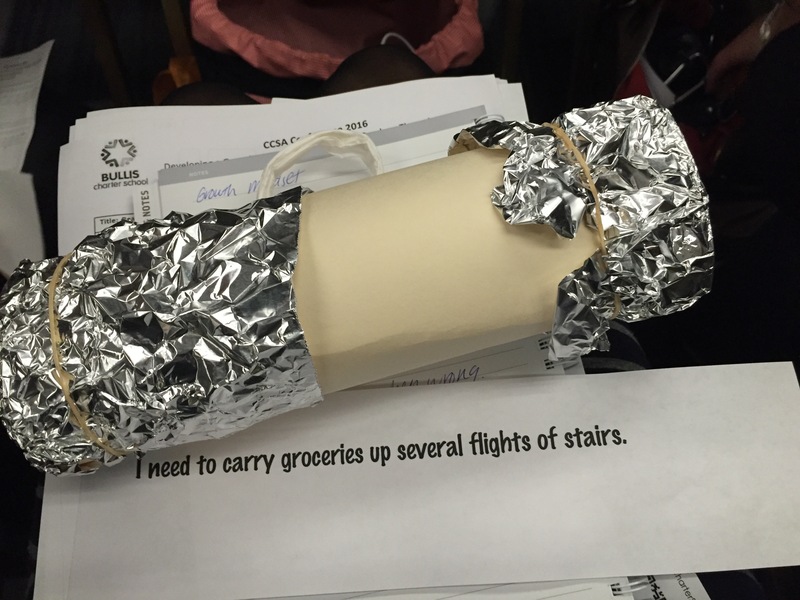 We had to create something to carry groceries up several flights of stairs. It required teamwork, thinking outside the box, and grit. Having students and staff that embrace a growth mindset will make for a space were it’s OK to make mistakes, and where we can ask for help and perfection isn’t expected. During our time in Long Beach, Alaina and I were on a quest for the best almond milk latte. Unfortunately Village Grind didn’t quite do it for us. But Lord Windsor and Recreational Coffee were incredible. Lord Windsor was a little more Intelligensia in Long Beach. It was a no frills, strong latte with bold coffee flavor. The foam was the best part of this latte. Recreational Coffee was our favorite. It was smooth, slightly sweeter. The staff was also much less intimidating. We went back a few times 🙂 We also celebrated St. Patty’s Day with Green Rainbow Juices and some Michgan Oberon beers at The Blind Donkey. Here is our lovely beverage collage. Wednesday afternoon Kelli, Mallory, and I went to How World-Class Schools Establish a Clear Vision for Instructional Rigor. This was led by Building Excellent Schools leaders, the network Equitas is a part of, so it wasn’t very new but a great refresher and reminder. I was reminded to do rigor walkthroughs to get a pulse check on the level of rigor at our school. I also feel the need to discuss as a team what rigor means to us so that we have a common definition. Woah, OK I’m getting tired of typing this all out, but just a little more to go. Thursday Soledad O’Brien led a panel with charter school leaders and the general theme was how can we ensure bureaucracy and red tape doesn’t stop charter schools from making their impact. There was also a lot of discussion regarding authorization of charter schools, and maintaining quality. I forget how much districts feel threatened by the charter world. My thought, fix your schools so that we’re competitive. Alaina and I both attended Amplifying School Impact Through Strategic Leadership. The facilitators really engaged us and had us working in groups of four then in triads. Similar to the Sped session from Wednesday, we learned key components to a strong school, watched a video of a school exemplifying this components and in groups discussed evidence of those components. Then, in triads, we completed a protocol with a need our school has to help us brainstorm solutions. It was a nice reminder of the need for structured collaboration within PD. Thursday I also attending Living Your School Mission. It was meh. Honestly, the biggest take away from this session was how to lead a session. You have to move across the room and engage the participants. You can’t just talk to us for an hour straight about what your school does, and you have to smile and have energy. This ended up finishing early, so I joined Alaina for the last part of Student Led IEPs. We have a plan to slowly grow our involvement of students in IEPs. As much as we want to go straight to student led meetings, we know it takes time to develop a strong structure. Whew. That was a lot! I doubt anyone made it to the end, but like I always say…this is MY journal 🙂 It was so fun being a student for a few days. I learned so much to hopefully help EQ3 become even stronger! This entry was posted in Education, Training and tagged berlin bistro, building excellent schools, ccsa, ccsacon, growth mindset, long beach, lord windsor, recreational coffee, st pattys day, sweet dixie kitchen. Bookmark the permalink.